Erice is a real place. Sometimes, when I look back, I think I may have imagined it. A bit like Brigadoon. But no, I have the pictures. Go back a thousand years or so. Back then, your friends were the people you lived with. The people in the valley or the next mountain were as foreign as fish. So if you could find a mountain with sheer sides and a good view of your farms, invading ships and noxious neighbours, and fierce Moors you had a winner. 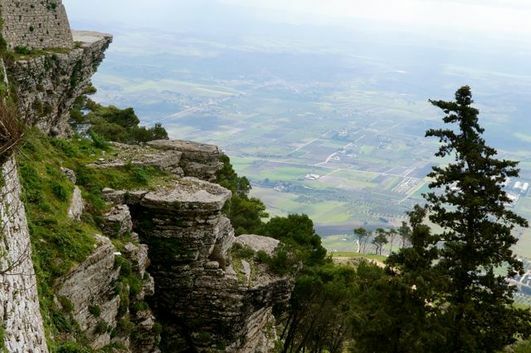 Voila, we give you Erice, a medieval village perched atop a mountain looking down the coastline of Trapani in Sicily. In the summer time, the beauty of this medieval village is breathtaking. Views from the mountain perch as well as its fort and churches are taken from the pages of dungeons and dragons. ​Like a magnet, a wave of tourists are drawn up the magnificent snake of a road that twists endless 180s up the side of the mountain. 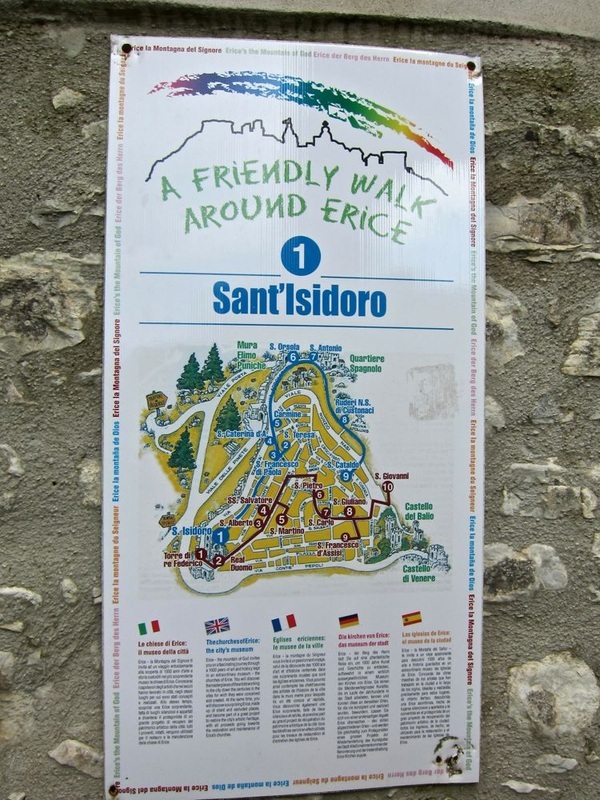 Here's a map of Erice to guide your trip. In early spring when we were visiting the southern part of Italy, the beauty of the place was mixed with a sense of lonely isolation that made imagining the 14th century a very easy trick. Thus, the Brigadoon dream feeling. The streets are so narrow Grumpy had to walk sideways. The spring flowers are enjoying their moment of freedom before the gaggle of chirping girls ascend to crush them in photo ops. A wonderful wine bar and coffee shop seems permanently open next to the Chiesa Madre. It features cakes and marzipan produced by the trolls that poke about in the village all winter. You will rarely have an equal chance to feel and savour a thousand years of history stripped of dates and pompous kings and laid bare to call back the temper of the times. No tourist guides, no Chinese dolls, no Malaysian biscuits, just history. Dedicated to Our Lady of the Assumption, this Gothic style Chiesa Madre was built in 1314. 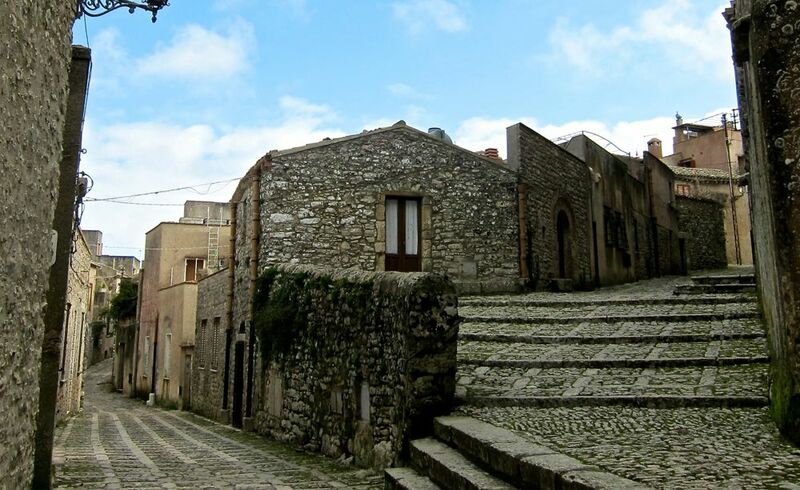 The present bell tower was formerly a look-out during the War of the Sicilian Vespers in the 13th century. Inside on the main altar is a famous art work, a marble icon by Giuliano Mancino dated 1523.